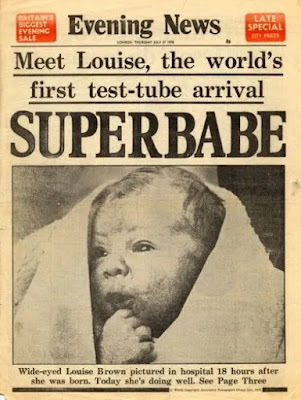 On July 25 1978, Louise Joy Brown, the world’s first test tube baby, was born. After trying for nine years to conceive, John Brown and his wife Lesley met obste trician Dr Patrick Steptoe and his research partner Dr Robert Edwards in 1977. Steptoe and Edwards’s were working in the experimental field of invitro fertilization and were able to successfully implant an embryo into Ms Brown (notably from a petri dish, rather than a test tube). Nine months later, Louise Brown was delivered through a planned cesarean section at Oldham (England) District General Hospital. She weighed five pounds and 12 ounces. Public reaction in relation to the success of in vitro fertilization was mixed. The term “Frankenbabies” was later coined. On the day of her birth, the institution’s halls were lined with police officers and when the new family arrived home 100 reporters blocked the streets.